Stacy Adams, Vice President of Marketing at mBlox shares what you need to know about Application-to-Person SMS versus Over-the-Top messaging, and the battle for consumer mobile engagement. Today’s messaging landscape is rapidly diverging. Facebook’s acquisition of WhatsApp and Alibaba’s investment in Tango emphasizes today’s shift by consumers to over-the-top (OTT) messaging applications to communicate peer-to-peer. In contrast, the use of application-to-person (A2P) SMS messaging, the channel businesses use to engage with customers, is on the rise. The increased activity in OTT messaging is primarily centered on person-to-person or P2P messaging. P2P messaging refers to messaging between the mobile devices of consumers, like texting a friend or family member. One of the main appeals of OTT messaging is the cost savings consumers can realize. While “all you can eat” consumer messaging plans have been popularized in the US, mobile users in many other countries pay fees on a per text message basis. While cost savings and added functionality like avatars and multi-media capability have made OTT messaging popular for P2P messaging, the same conditions do not exist for messages sent from enterprise to person or application to person (A2P). The worldwide messaging growth rate of 4% compounded, projected by Portio Research through 2016 is comprised of P2P and A2P messaging growing at 1.9% and 13.1% respectively. The principle cause of this difference is that A2P messaging is the only platform that maintains a single out-of-the-box community of users around the globe. If you have a mobile number you can participate in A2P messaging without being dependent on the ability to access the internet, the type of mobile device you use, or downloading a mobile app. These factors have made A2P text messaging a must-use tool for any enterprise or service provider in areas as diverse as financial services, payments and security, human resources, customer service and B2C marketing. Mobile aps will continue to be a critical part of businesses messaging strategy. Push messages can be engaging, especially when used for location-based campaigns. However to communicate to customers via push messaging, customers need to download and install the enterprise app. Shockingly only 80% of enterprise and branded apps are unable to secure even 1,000 downloads. Over time this will change. OTT messaging for business interaction will expand, but given the costs and the burden of effort placed on the consumer, it is not likely to become the staple that SMS has become in marketing or CRM use cases. At best, it will be a choice preferred by some, similar to email and voice. When thinking about the long term viability of A2P SMS, one must remember an essential fact. Consumers prefer simplicity and choice. Stacy Adams is Vice President of Marketing at mBlox. 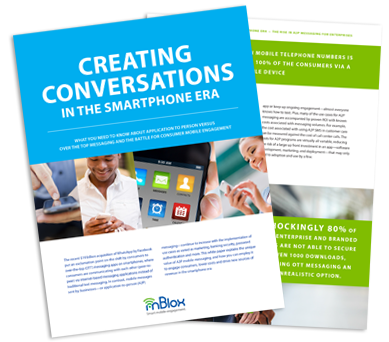 Download the mBlox white paper ‘Creating Conversations in the Smartphone era’ for more insights into the differences between A2P and OTT mobile messaging.